I once dreamt I was a bird flying over Russia. 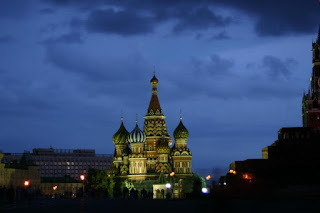 My dream was full of fascinating medieval Russian architecture, Saint Basil's Cathedral even made an appearance. This dream was one that was so real and vivid that when I woke I remembered that feeling of flying, and the beautiful views of Russia I had. The latest collection from Chanel, pre-fall 09 to be exact, took me back to Russia and left me in a dreamlike state. This collection like my dream was full of medieval Russia. While viewing this collection I thought of Russian Folklore,the frog princess instantly came to mind. I imagine myself prancing through the streets of Russia in Chanel.....hey, a girl can dream, can't she?